Teachers around the country, and even the world, are discovering that sled dog racing is a great vehicle for introducing energy, enthusiasm, and real world problem solving into their classrooms. When you combine adventure, dogs, competition, amazing scenery, and down-to-earth heroes, you have a perfect recipe for student engagement. Just as Nathan was introduced to the idea of sled dogs by a teacher, he is working hard to encourage a love for his sport in kids. Who knows, maybe he will motivate the next race champion! Nathan has shared his story with teachers and students around the country. He has presented at the Iditarod Winter Conference for Teachers, The Mid-West Sled Dog Symposium and Teachers’ Conference, the joint Iditarod/Beargrease Educator’s Conference, and the Baltimore Iditarod Teachers’ Conference. He has also presented at many schools in the Duluth area. 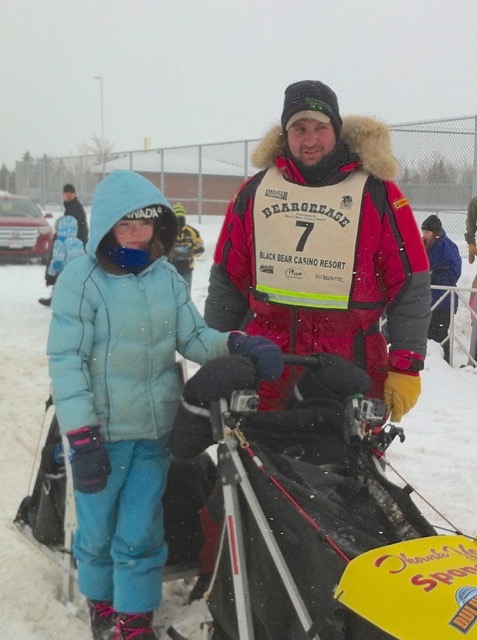 Julia and Nathan at the 2014 Beargrease Starting Line! Junior Musher, Julia Cross, interviewed Nathan for an article she wrote for Sleddogger Magazine. You can read the article here. 2014 Iditarod Teacher on the Trail Jen Reiter followed Nathan’s journey on the trail and reported to students. You can see the related posts here.